Below is a freshly built 3,000cc Corvair running in front of our hangar. We built it for Zenith CH-750 builder Lary Hatfield. Grace and I met Lary and his sons at the 2011 Zenith Open House in Mexico, Missouri. The Hatfields were taking the Zenith Builders Workshop and picking up their airframe kit. They got a good look at all the engine options for the aircraft, considered carefully and selected the Corvair. Lary acknowledged that each of the engine options for the 750 had some appeal, but our knowledge of the engine, our 23 years in the business, the number of Zeniths flying on the Corvair, and the fundamental simplicity of our approach made the decision for him. The economic appeal of the engine that attracts many people was not a factor. Lary speaks with a lot of fatherly pride about his sons’ hard work ethics and their personal successes. Although he never mentioned it, I am guessing that Lary could afford any engine on the market. Lary and his sons have a very strong aviation background. When men of this experience and means study the options closely and select the Corvair, I take it as a compliment to our efforts. When we first started, the Corvair was seen as a low cost alternative for people economically excluded from hand-me-down certified engines. After two decades of development, testing, flying and teaching, the Corvair has now evolved to a top tier engine, a first choice powerplant. Above: The engine during its first break in run. We operate it between 1,800 and 2,200 rpm for 30 minutes. The primary purpose is to break in the cam and lifters. We only use Shell Rotella 15W-40 oil for this, and we use an additive called ZDDP. We do the break in with slightly conservative timing, and run the engine on 93 unleaded fuel to avoid having lead deposits in the engine if it is going to be stored for a while before it is flown. In the presence of moisture, the byproducts of combustion from 100LL fuel can be corrosive over time. 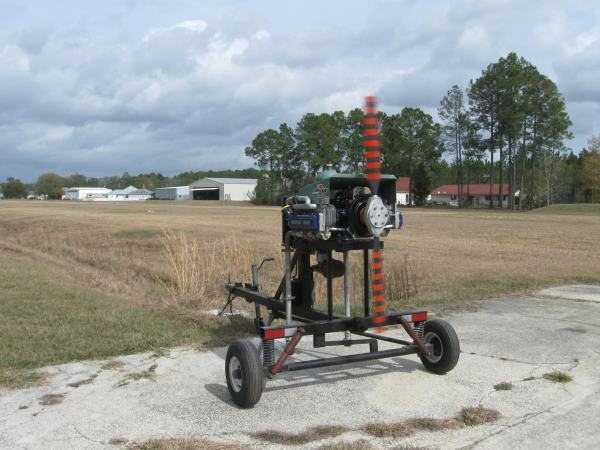 You can see that the run stand is chained down to an 800 pound concrete block we cast into the lawn next to the ramp. The only thing visible on the block is a 1/2″-20 threaded bolt hole. It is actually the balancer end of a scrap Corvair crank that we cast into the block. It’s not likely to be uprooted any time soon. Above is a look inside the 3,000cc Engine. It is a big brother to the 2,850. The centerpiece of both of these engines is a drop forged, CNC machined, made in America, very high quality piston manufactured to our specifications. It has a very specifically designed pocket, and a flat quench area, for use with the 110 and 95 Corvair cylinder heads. The step that the head gasket sits on can be entirely machined out of the head so that the quench height of the engine is solely the head gasket thickness. This could be done before, but would result in an alarmingly high compression ratio. The pocket in the piston takes care of this, keeping the compression ratio reasonable. Other pistons for Corvairs have had little dishes cut in them before. But we had these pistons specifically forged with thick domes to allow the pocket to be machined as deep as it needed to be without compromising the strength of the piston. In operation, this engine has extremely high turbulence and very good atomization of the fuel, yet a static compression ratio that will easily run on 93 octane fuel without retarded timing. These combustion and ignition characteristics have the potential to make this engine more powerful than a 3,100cc Corvair with its required retarded ignition timing. There’s a number of other reasons we selected 3 Liters as our new standard large displacement engine, but the primary goal was to produce an uncompromised large displacement Corvair that will operate in a future where the affordability of 100 low lead may come into question. The 2,850 has the same characteristics, but it is the largest displacement that can be made without machining the case. Above:The 3,000cc engine makes 120 continuous HP at 3,150 rpm. The engine has no difficulty making this power output and remaining cool while doing it. In this photo, the engine is running on the same MA3-SPA carb that we test all of our engines on. This is the most popular carb for CH-750s. Next, we will test this engine with a Precision mechanical fuel injector. It is expensive, but it is made by the same people who produce injectors for certified aircraft. We run the engines with cast iron manifolds and small mufflers to get it quiet so we can listen to the engine internally during the break in. This engine performed flawlessly. Grace’s 1946 Taylorcraft sits on the lawn behind the engine. The engine above is built with a Modex-prepped forged and nitrided crankshaft. It has a Weseman 5th bearing, as well as a brand new valve train including the cam drive gears, lifters and pushrods. The forged pistons and cylinders are new and the rods are Clark’s rebuilt with ARP rod bolts. The heads have new seats and guides and stainless valves set with exhaust rotators and new springs. The engine has one of our new high volume oil pumps and a Dale harmonic balancer. It features all of our Gold Oil System parts,including the Billet Pan and Deep Sump Pickup, our Short Gold Hub and Front Starter System, a 20 amp charging system and our redundant Electronic and Point (E/P) Ignition System with spiral wound ignition wires. 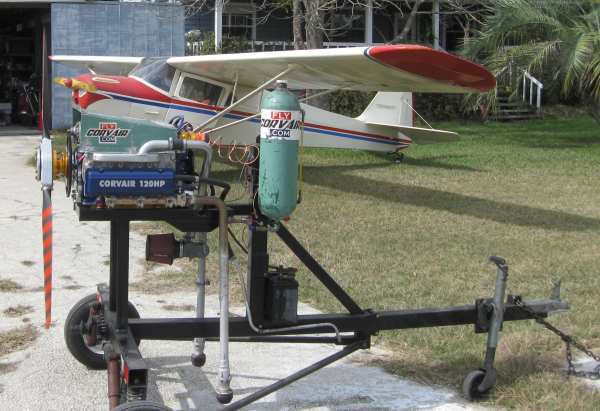 Because it varies from airframe to airframe, the carburetor is sold separately. We build these engines for $11,500. A dedicated builder working in his shop can build a clone of this engine for $7,500 in parts and about 150 hours of his time. (Smaller displacement engines like the 110hp 2,850cc and the 100 hp 2,700cc can be built on significantly tighter budgets.) We are glad to work with both groups of people. With other engines, the engine is always configured in the way that is easiest for the factory to make, or the most profitable set up. Your Corvair engine can be built in any way that suits your airframe, budget, timeline or personal goals. Our main focus is, and will always remain, teaching builders how to build their own engines. This is the approach of 95% of the people we are working with. We are the only engine company on the market dedicated to giving people who wish to build it themselves access to a top-level engine. We build a small number of engines a year. These are done as educational showpieces that effectively demonstrate the potential of the engine. With this purpose, the engines we build are assembled out of the finest materials and parts. I personally assemble each of them, and I take as many hours as needed to do so. Afterward, each of them are given a long break-in run process, and then a final tuning. These engines only serve their purpose if they provide long trouble-free service to their owners, in the process demonstrating to observers how well the Corvair works. Again, 95% of these observers will choose to build their own engine with our parts and assistance. In plain terms, this means that our motivation when building an engine for a family like the Hatfields is to produce the finest engine, not the most profitable one. Contrast this with traditional automotive conversion engines. Those engines were sold as the sole profit-maker by companies whose overriding goal was to make money. Many of these engines were based on things pulled directly from cars, cleaned and declared airworthy. Companies that did rebuild engines were tempted to cut every corner inside, because that’s how they were going to make more money. Most of these companies were LLCs with 3 year life spans. They knew that if they sold 100 engines in the 36 months, 90 of the engines would not be mounted on an airframe. Their high time customer engine would likely get less than 100 hours. If that guy had issues, they could keep him quiet by sending him an “updated” engine or offering him some money back. By the time the majority of buyers discover that there are issues, the LLC has folded up the tent, and they don’t have to stand behind anything. This isn’t a bad dream, nor is it far-fetched. When I got started in 1989, there were 40 or 45 nationally known alternative engine companies. Today, just 3 of these remain, and the only other one that still goes to Sun ‘N Fun and Oshkosh is Steve Bennett at Great Plains VWs. There were 15 companies offering EA-81 Subarus, all gone now. Zoche Diesel never turned out a product. The Cam 100 Honda, and almost all the other Honda people, are gone. A half dozen outfits that offered small turbines and delivered nothing are gone. So are most of the V-6 people, and all the V-8 outfits I can think of except one. These companies were designed and run to make money, not to last. When they disappeared, they took a lot of people’s money and dreams with them. Corvairs have seen their share of these people. In the past 5 years their have been four LLCs that sprang up to make Corvair parts. All four are bankrupt today. All of them were previously customers of ours. Naming them doesn’t matter as much as understanding that there will certainly be new ones over time. While I feel some sympathy for people who were taken by these LLCs, it isn’t my obligation to help out the people stuck with orphan products, and this includes not having them at our Colleges. Everyone understands that your local Ford dealership isn’t going to work on a 1986 Yugo. It’s the same thing here. I include this as a reminder to builders that most of the people who start an aircraft project don’t finish it. Our builder completion rate is about 35% after four years. This is twice the industry average. There are a lot of reasons why the industry is so low. They are incentivized to sell you things, not teach you things. The journalists writing about planes generally haven’t completed a plane, and 95% of them have never gotten their hands dirty on an aircraft engine. There are countless Web sites with disinformation provided by people you will never meet. Reading them allows these people to affect your perspective and reduces the probability of your success. These factors are never going to get better, and in all likelihood are going to get worse. The good news is that you can exercise good decision making skills, pick the right people to listen to and learn from, work with proven companies and navigate your way through. Last year, nearly 1,000 new amateur built aircraft were completed and registered with the FAA. If your personal goal is to learn, build and fly, we will be glad to work with you to get your name on the next list. The engine is test run and all the settings have been verified, but all engines need some other parts like ignition switches, fuel lines and other stuff to run them on your plane.